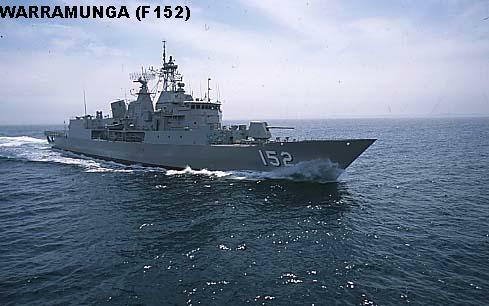 Warramunga (F152) is the third of Australia's eight Anzac class frigates. 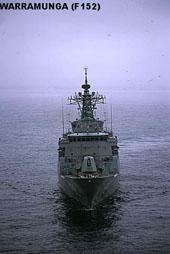 These are general-purpose patrol frigates, a variant of the popular German MEKO 200 design. 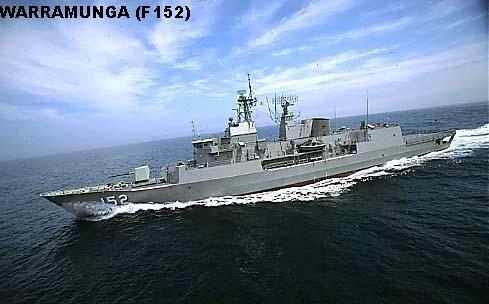 The Anzacs are fitted with an 8-cell vertical launch missile system, a 5 inch (127mm)/54 caliber gun, 12.75 inch torpedo tubes, and a flight deck and hangar for a single helicopter. 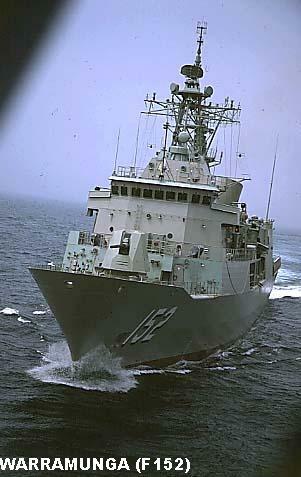 The 8-cell VLS accommodates 8 Sea Sparrow missiles in the first two ships of the class, but Warramunga and later ships can carry 32 Evolved Sea Sparrow Missiles (ESSM) in the VLS. There are provisions for additional weapons, which will be fitted in the future. 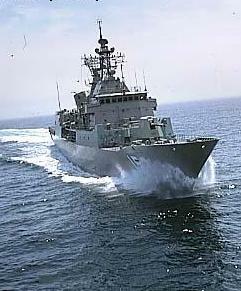 The first ship was commissioned in 1996, with the last scheduled to commission in 2004. These photos show Warramunga on her final contrator sea trials late in 2000, in prepartion for commissioning early in 2001. The photos are RAN Official, provided courtesy of Tom Rynders. 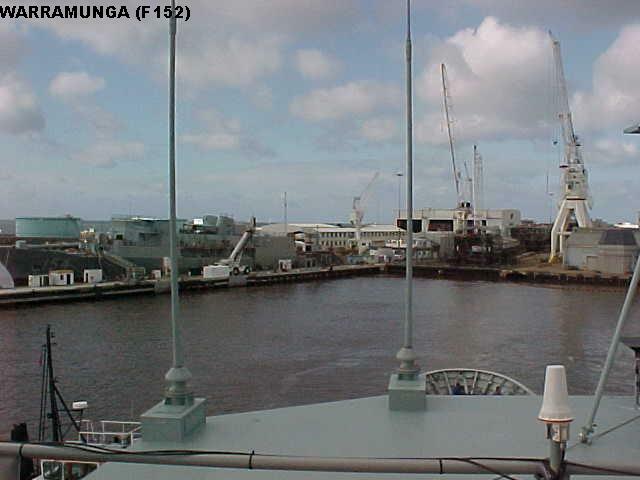 View from the signal bridge as Warramunga gets underway from the Tenix shipyard. 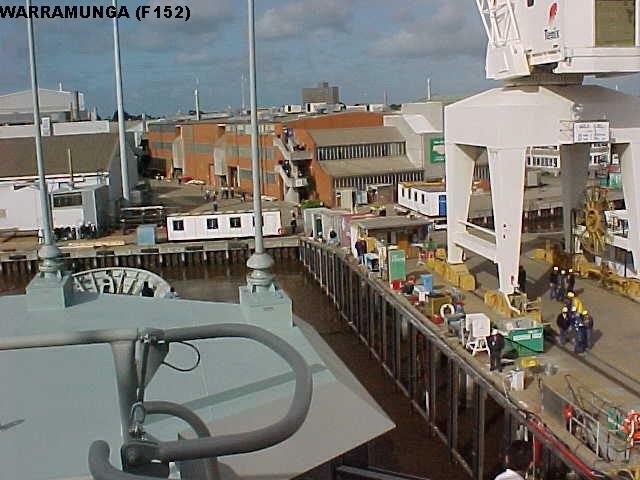 A view of the Tenix shipyard as Warramunga gets underway, showing Parramatta (F154) fitting out at the pier. 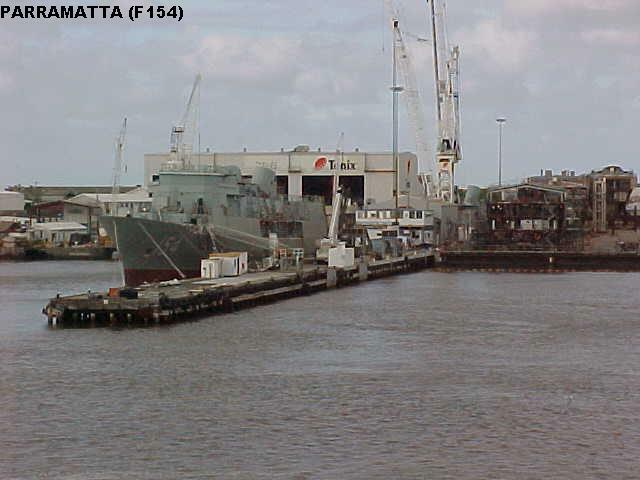 Another view of Parramatta fitting out. 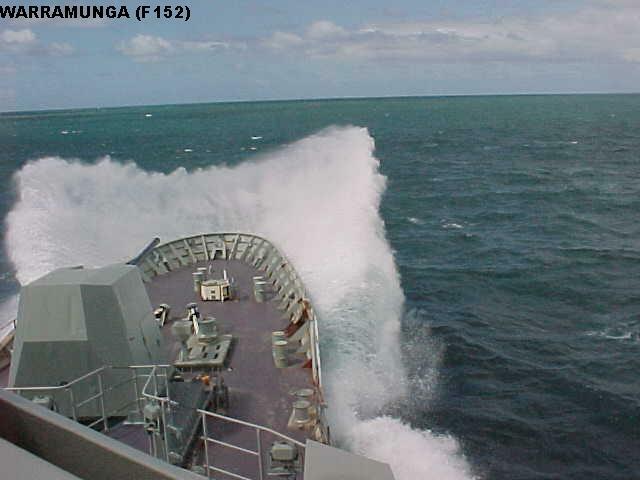 Warramunga's bow pushes up spray as she plows through the seas. 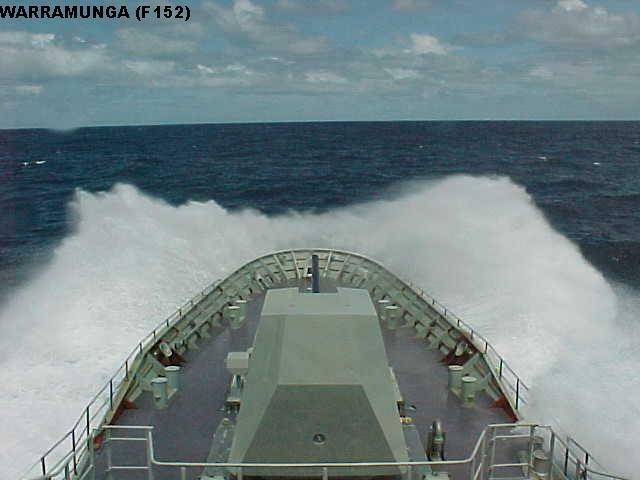 Another view from the bridge, pushing through the seas. 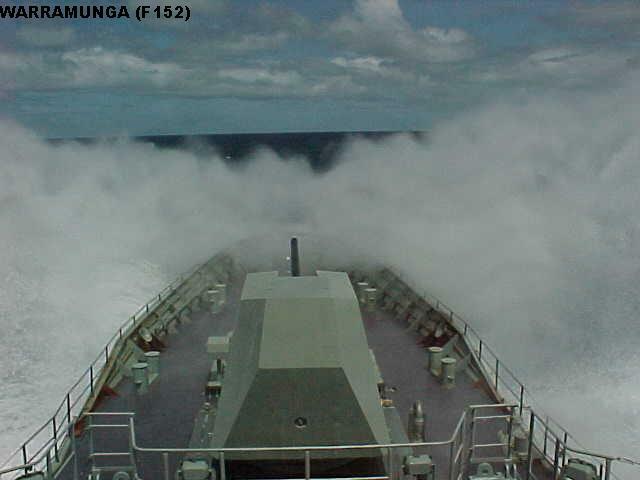 Although the bulwarks keep the deck dry, a small amount of spray does come aboard. 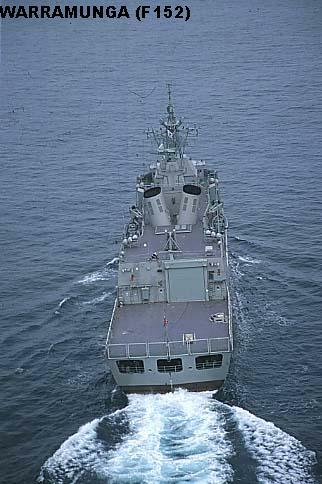 Aerial view of Warramunga at sea on trials. 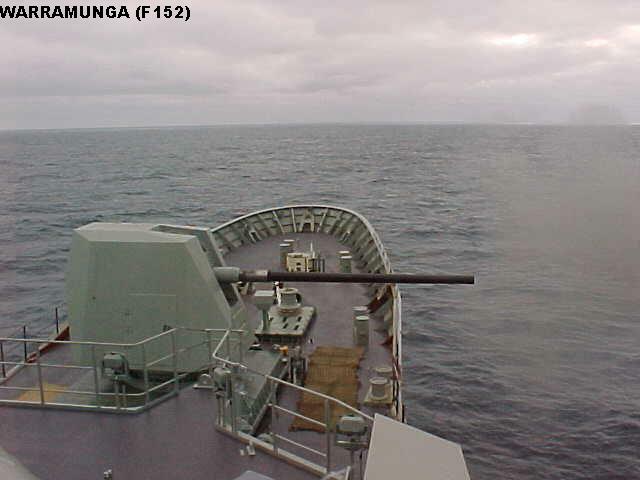 A fine starboard bow view of Warramunga. 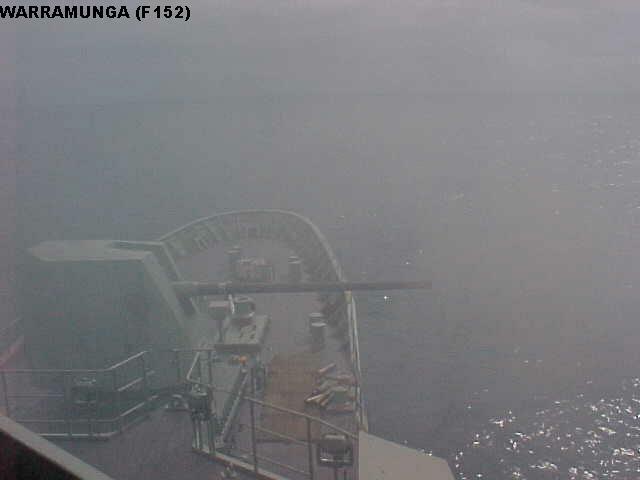 A bow-on view of Warramunga. 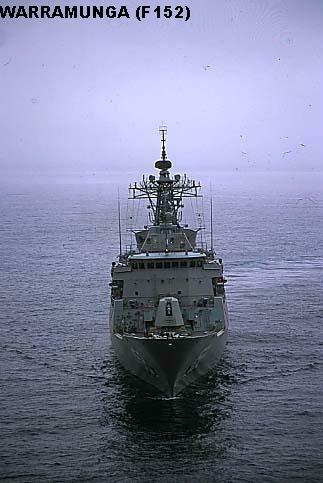 A fine port side view, showing the ship's general arrangement to good effect. A stern view, showing the flight deck, helo hangar, and the 8-cell VLS just abaft the starboard funnel. 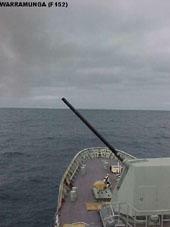 The 5"/54cal gun fires its first shot during sea trials. 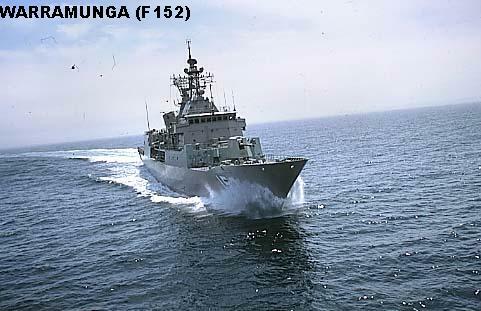 The ships use the US Navy's standard 5"/54cal gun, which could be upgraded to 5"/62cal if desired. 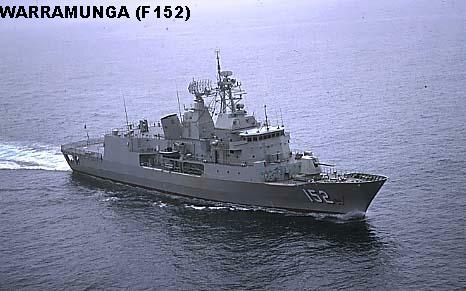 Although the first two ships of the class have the older, rounded gun shield, Warramunga has the newer, angular shield. 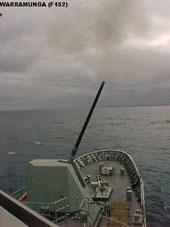 The gun is obscured by smoke as it fires to starboard. 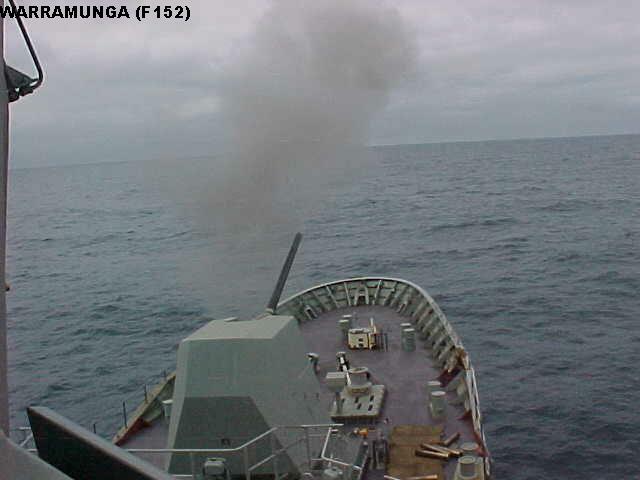 The 5"/54cal gun firing dead ahead. 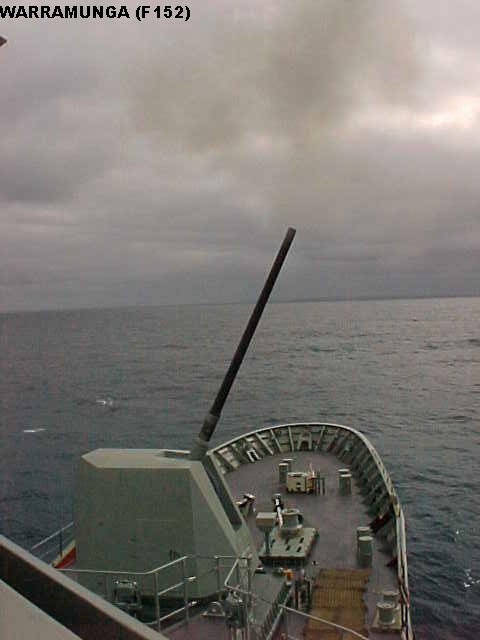 Firing to port at a high elevation angle. 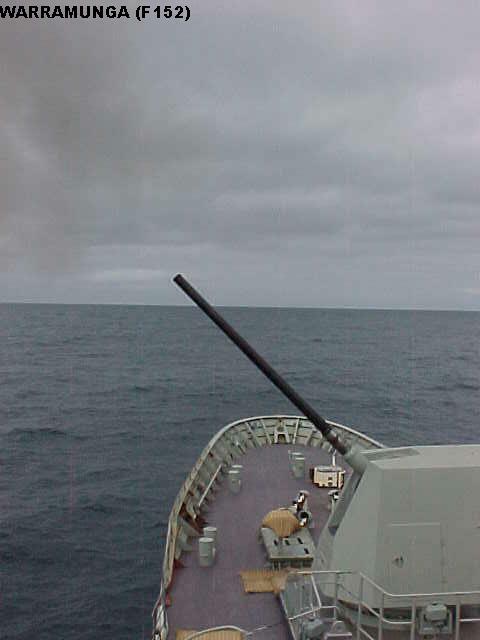 Firing to starboard at extreme high angle.